Dr. Alan Christianson is a bestselling author and Naturopathic Medical Doctor based in Phoenix, Arizona who specializes in natural endocrinology. In The Adrenal Reset Diet he offers an innovative plan for addressing the function of your adrenal glands. When the adrenal glands are stressed or depleted this can disrupt cortisol production, which directly affects your weight and energy. Dr. Christianson believes that The concept of weight gain being simply caused by overeating is no longer supported by scientific research. One possibility is that people gain weight as a survival response to the demands of daily living. Exposure to toxins, processed food and chronic stress all takes a toll on your adrenal glands. One very important function of the adrenals is the regulation of cortisol – a hormone involved in stress and fat storage. When the daily patterns of cortisol production become disturbed you gain weight more easily. Additionally you may experience chronic fatigue and have a reduced ability to cope with stress. You don’t need to count calories on the Adrenal Reset Diet. Instead you will measure your portions of protein, fat and carbs for each meal. Each day you will consume three balanced meals. Snacks are optional with recommendations including raw veggies and fresh juice. Consuming a low calorie or low carbohydrate diet can disrupt adrenal gland function and increase cortisol production. This raises your blood sugar and make it difficult to get a good night’s sleep. Ultimately this can also make it more difficult to lose weight in the long term. However, a high carbohydrate diet is not the answer. Too many carbs can cause fatigue and promote fat storage. Carb Cycling provides the answer to this dilemma. To overcome the negative effects of low and high carb diets the Adrenal Reset Diet utilizes the concept of carb cycling. Breakfast and lunch are higher in protein with a small portion of high-fiber carbs. The evening meal includes a higher amount of carbohydrates. Varying your intake of carbs keeps your cortisol levels where they need to be throughout the day. It also keeps them low enough at night to allow for deep sleep. Each day carbohydrates should make up between 30 and 40 percent of your caloric intake, with most of these coming from vegetables. Chicken, venison, grass-fed beef, seafood, brown rice, rice bran, quinoa, black beans, lentils, chickpeas, almonds, pistachios, chia seeds, pumpkin seeds, asparagus, arugula, carrots, okra, sweet potato, swiss chard, tomato, avocado, broccoli sprouts, apples, berries, cherries, figs, pomegranates, coconut oil, olive oil, stevia, xylitol. Too much exercise can do more harm than good in people with adrenal issues. A gentle morning walk in the sun for ten to twenty minutes is ideal. After a few weeks you can add another daily walk in the evening. Restorative and Yin Yoga is also recommended but strenuous styles of yoga should be avoided if you have adrenal fatigue. 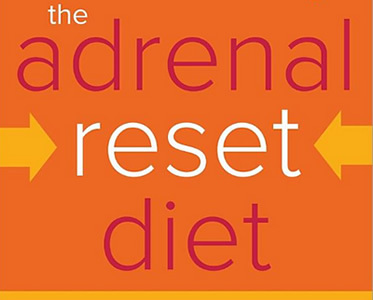 The Adrenal Reset Diet: Strategically Cycle Carbs and Proteins to Lose Weight, Balance Hormones, and Move from Stressed to Thriving retails at $26. Includes a 7-day meal plan with recipes. Scientific research verified weight loss and improved adrenal function on the diet. Includes nutritional, herbal and lifestyle strategies for dealing with adrenal fatigue. Addresses the importance of adequate good quality sleep for weight loss and health. Requires measuring your portions of protein, fat and carb foods in each meal. Some of the recommended herbal supplements may not be well tolerated by a small percentage of people. Individuals with chronic adrenal fatigue may need guidance from a health professional to overcome their condition. The Adrenal Reset Diet was designed to support optimal adrenal gland function, which leads to natural weight loss. It involves adjusting your intake of carbohydrates throughout the day in order to normalize cortisol production. This program is appropriate for dieters experiencing chronic fatigue who have not been successful with low calorie dieting. Restoring adrenal gland activity can result in easier weight loss and an overall improvement in health. Alan Christianson, N. M. D. (2014). The Adrenal Reset Diet: Strategically Cycle Carbs and Proteins to Lose Weight, Balance Hormones, and Move from Stressed to Thriving. Harmony.